As many of you know, the best part of my job is that I wake up every day never knowing “who” I am going to meet or “what” wonderful and exciting experience will come my way on any given day. Last Wednesday was one of those days. I had the opportunity to meet one of the most inspirational men I have ever met – Augie Nieto. 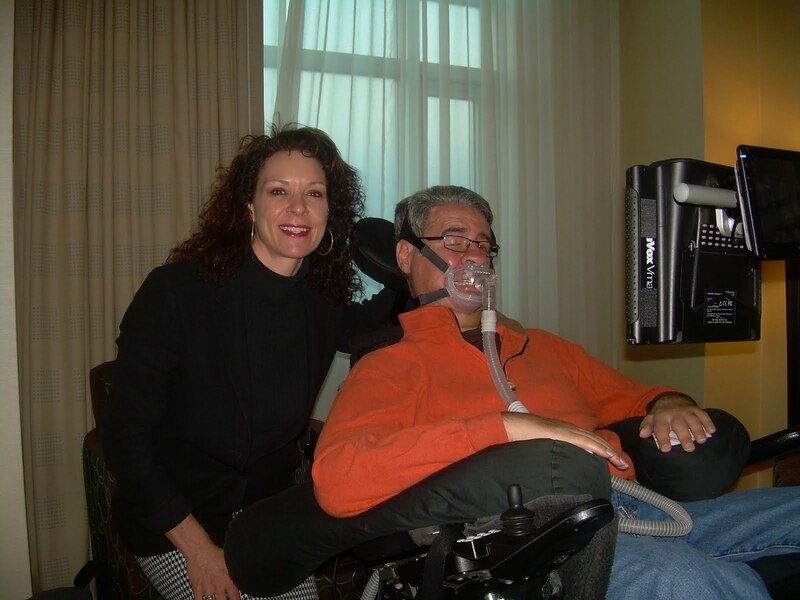 In 2005, Augie was diagnosed with ALS or Lou Gehrig’s disease, as it’s more commonly known. The disease has taken a huge toll on Augie physically, but has done little to diminish his spirit. Over the last five years, Augie has raised nearly $27 million for ALS research through his fund-raising campaign, “Augie’s Quest.” Augie and his wife Lynne have partnered with the Muscular Dystrophy Association’s ALS Division to raise awareness through public appearances, speaking engagements, media interviews, and public service announcements. He was here last week to share his story with the Young President’s Organization, which held its Global Leadership Summit in Denver. Augie was able to talk with me via a computer he controlled with his feet and eyes. He has a wonderful sense of humor and an amazing will to help others. While visiting with Augie – I was moved to tears – – literally – – I can’t express what a beautiful experience it was! Below is a photo I will treasure for a lifetime. I was privileged to help promote Augie’s appearance and the upcoming ALS fundraiser, The 5th Annual A Gift of Time Mile High Bash, which takes place at Invesco Field on March 19th. Radio host Stephanie Riggs interviewed Lynne about Augie’s work and the fundraiser on her show, Divine Calling, which airs on KRKS 94.7 FM. 850KOA Health Reporter Robbyn Hart also conducted an interview with Lynne, which should air in the coming weeks. I hope you’ll consider supporting the Nietos’ efforts by attending the Mile High Bash. The event includes cocktails, a silent auction, dinner, a live auction and entertainment. Tickets are $150. More information can be found here. And please take a moment to watch this footage from the Today Show to learn more about Augie’s story. I am certain it will move you as it did me.